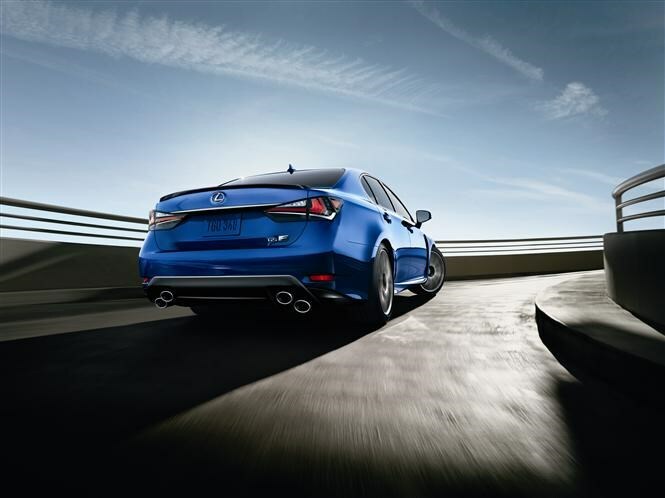 The Lexus GS F is a high-performance version of the luxury Japanese brand’s four-door GS saloon. First introduced at the Detroit Motor Show back in January, Europeans will get a first chance to see the car at the Geneva Motor Show next month. It’s a rival to the BMW M5, Mercedes-Benz E63 AMG and Jaguar’s XFR-S – which means it’s got a huge amount of work to do since all three of those cars are among our favourite high-speed family vehicles. They all feature stunningly powerful V8 engines which sound brilliant and provide prodigious performance. The new GS F is powered by a huge 5-litre engine with 470bhp and 530Nm of torque; this is anything but a shy and retiring rep-mobile. The engine is mated to an eight-speed automatic gearbox which has both a manual mode (so you can change gear yourself) and four ‘modes’ for different types of driving: Normal, Eco, Sport and Sport+. 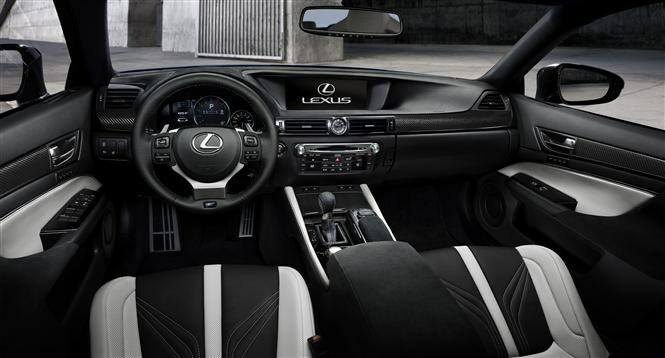 It is the same engine and gearbox as used in the Lexus RC F high performance coupe. Uprated suspension sits the car atop 19-inch alloy wheels, hiding improved brakes to slow the big GS F down from what’s set to be an impressive top speed. Handling promises much too – there’s a Torque Vectoring Differential (TVD) that meters out power to each of the rear wheels. It has three operating modes: Standard (for normal driving), Slalom (for sharper steering and agility) and Track, which is best-suited to circuit driving. Sporty bodystyling on the outside is complimented by a cabin designed with the driver in mind. For example the electronic display automatically adjusts the content and appearance depending on the driving mode selected. 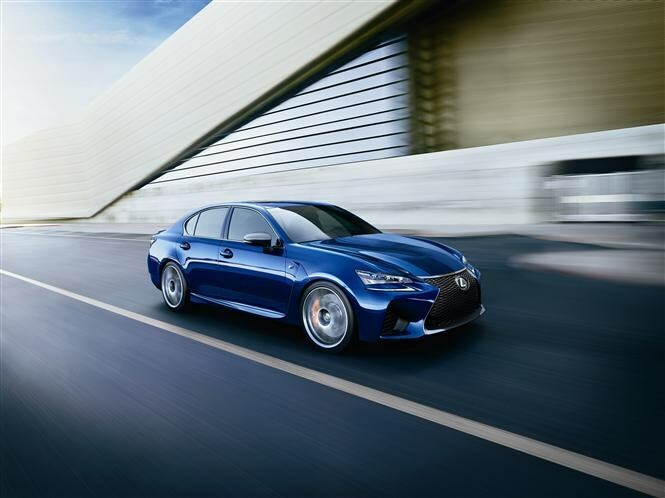 Custom-designed front and rear seating also adds to the GS F’s dynamic appeal, while a 17-speaker stereo system is set to provide an alternative soundtrack if you ever get bored of the V8 and its ‘active sound system’, which amplifies engine noise for a sportier driving experience. 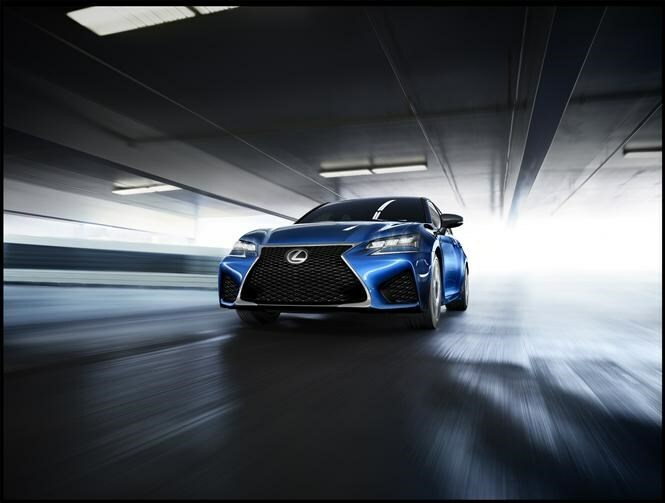 The GS F will also feature a number of safety system including automatic braking, lane departure warning and an active high beam assist function for the headlights. We’re expecting more details to emerge later in 2015 along with a launch date. To find out more, keep an eye out for the full Parkers Lexus GS F review coming soon. Our road test experts will be among the first to drive this hot new saloon.